Have you ever attended an event and left feeling rejuvenated and ready to conquer the world? Hosting events for your customers comes at great costs, labor and resources, but at the end of the event both you and your customers benefit. Landscaping events can be found all over the world and at different calibers. So what makes a landscaping event successful you ask, well that depends on your objectives. 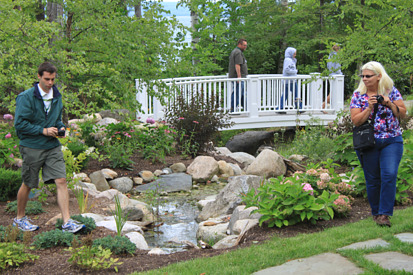 Many events rally behind tours, designed to showcase landscape projects either created by the host or customers of the host. Selection of sites can be time consuming as the quality of the installation, the willingness of the homeowners and accessibility to the site all come into play. It seems the best projects to showcase are those that most inspire you. If the project is something you liked and enjoyed, it makes it much easier to promote. If a water garden tour is your preference we suggest you try a few ideas while preparing for your event. 1. Prepare host sites well in advance (months): Maintenance tips for keeping the project looking it's best for the special event is important and if monies allow, this would be a great time to offer a Maintenance Contract. 2. Create an event schedule book: Time lines, maps and write-ups for each site. Pictures and descriptions can go along way especially if you showcase before and after photos. 3. Feed me: You like to eat and if you plan on keeping folks motivated and moving for an entire day, ask your host sites to serve snacks, drinks and of course- chocolates for that sweet tooth. 4. Provide transportation: Although buses or vans can be an extra expense, the valuable face-time is priceless. Play games, ask for site feedback and increase engagement. Otherwise-here's to car pooling and Q&A sessions. 5. Share photos: Create a Dropbox account or a cloud-like file for picture sharing. Facebook works great too! 6. Keep the tour informative and educational: Participants invest time into your tour so handouts and discussions are key. Provide resources, tips sheets and material lists if possible. Despite all the planning and amazing landscape projects you may have on the tour, the success of your tour will hinge on good host participation and the leadership of your staff to keep things moving fluidly. Have fun, laugh, do something adventurous if time allows and use these moments to promote future events.